British home technology manufacturer Dyson may be best known for its vacuum cleaners, but it’s fast becoming a big name in the wellbeing and personal care market, thanks to its recent innovations in hairstyling and home air purification products. 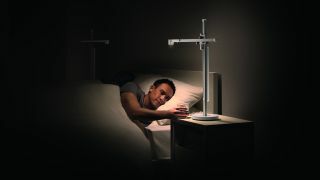 Now Dyson has launched two new products in this field; the LightCycle task light and the Pure Cool Me personal purifying fan are part of Dyson’s pledge to “give you control over many of the factors that impact your wellbeing, including the air you breathe, and the light, dust, and allergens you’re exposed to''. According to Dyson, the LightCycle is a task light that’s “designed to improve visual acuity and provide the right light for the time of day” by adjusting its color temperature (how warm or cool the light appears in terms of color) and brightness “in relation to your local daylight”. It does this by using a “unique time, date, and location-driven algorithm”, which was created using data from “a million satellite-based measurements of light conditions in the Earth’s atmosphere at different times of day”. The LightCycle itself contains a 32-bit microprocessor, which interprets this data, communicating it to the optical driver for “dynamic color tuning”, allowing the LightCycle’s warm and cool LEDS to simulate daylight color temperatures. You may be wondering why you would want such a complex light. Well, according to Dyson and institutions like Harvard Medical School, “low light, flicker, and glare can cause eye strain and visual fatigue”, which Dyson seeks to alleviate with the LightCycle’s “glare protection and low optical flicker” features. For added personalization, integration with the Dyson Link app means the LightCycle adjusts light output for your age and daily routine. It’s available in desk and floor variants, for $599.99 - $899 / £449.99 - £649.99. This works out at around AU$820 - AU$1200, but it doesn’t look like it’s available in Australia yet, with no word on when it will be rolled out to this territory. Dyson has also announced the launch of the Pure Cool Me personal purifying fan, which features some of the air filtration and air projection technology we’ve seen in previous products like the Pure Hot+Cool purifying fan heater. With its small stature, the Pure Cool Me is designed to sit on your desk, bedside table, or anywhere else you could do with a steady flow of fresh air. Aside from keeping you cool, the Pure Cool Me is made to filter the air you breathe in your home. While the company makes no claim that the fan could alleviate health conditions, the removal of many ultrafine particles could be an attractive prospect to those with allergies, or indeed, anyone who’s concerned about indoor pollution. The Pure Cool Me personal purifying fan is available to buy for $350 / £299.99, which works out at around AU$490 based on current conversion rates – again, Dyson hasn’t issued an Australian release date at this time.